Well I finally joined the Lange club. I thought I'd touch briefly on how I got here. I've long been an admirer of time pieces but didn't really have the means to purchase much. For high school graduation quite a few years ago my parents got me a Tag Heuer 2000 Series automatic. I remember at the time the jewelry shop owner suggested the quartz model as it would be more accurate, but somehow I was more drawn to the automatic. I still have that watch and the sentimental value to me means I'd never get rid of it. More recently I've been in a position where I could accord some new time pieces. I initially got an Omega Speedmaster Man on the Moon (new model, but manual wind and hesalite). I later got a Breitling Navitimer 01, and the added a Rolex Seamaster. About a year ago I added a green ceramic Submariner (The Hulk), which has been my favorite everyday time piece. While I love all the pieces in the collection, it is a clear a dress watch was missing. So I started exploring options. Initially I was drawn to the simplicity of the Vacheron Constantin Patrimony series. Elegant, clean, part of the Holy Trinity... However the led to the inevitable comparisons to Patek Calatrava's. This briefly led me to being convinced that a Patek must be my next time piece. As I read more, I started coming across articles that were mentioning Lange as a comparable quality time piece. I ended up at Tourneau in Vegas trying on some Patek's. I mentioned Lange to the sales person and she said they are not a AD but did have a couple preowned ones in the shop. They had a Lange 1 Rose Gold and a Time Zone Rose Gold. I was really impressed with the Lange 1 and told her I would think about it over the next couple of days. After a couple of days of more research and reading, I was completely intrigued by Lange. I called the shop back to ask about the Lange 1 and it had already sold to another customer. This ultimately gave me more time to explore things. I did find the AD in the Palazzo and looked at a bunch of models there. To be honest they all looked great... I also went to the AD in Chicago and looked at some models there. Their selection was smaller than in Vegas, but it was still helpful. After all of this I came to the realization that I likely will pursue more than one Lange for my collection. The original Datograph is an amazing piece and something I would love to add one day, but not currently in my price range. I also really like the Time Zone, specifically is white gold with the lume on the hands. I travel a lot internationally and this would be the perfect travel watch. I loved the Lange 1 when I tried it on, but ultimately the Time Zone takes some of its design heritage and adds the functionality of the dual time. However it is something I will need to save for and work towards in the future. That brought me back to my original quest. 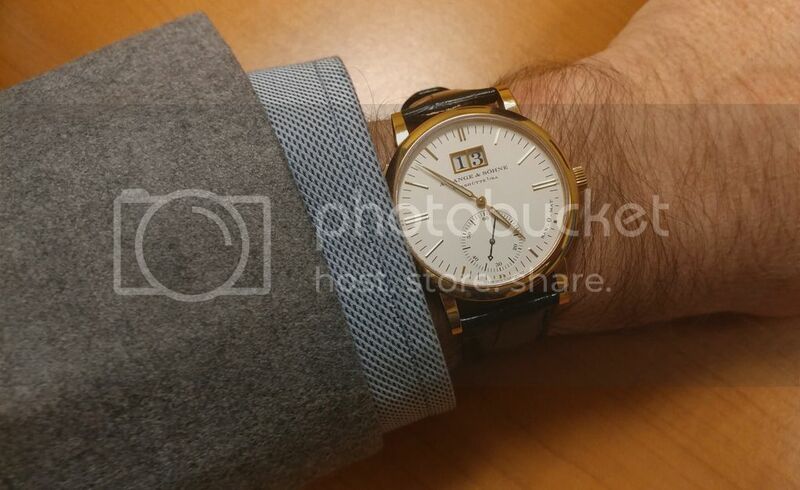 I started out looking for a classy, clean dress watch, preferably in Rose Gold. I also felt I really wanted a date complication and I have 6.5" wrists, so I had to take this all into consideration. I spent a fair bit of time exploring options. I decided to go the pre-owned route. Ultimately I found what I was looking for at the right price and pulled the trigger on a 308.032 Langematik with Big Date in Rose Gold with black strap. The watch is gorgeous and in my opinion very understated. Initially I felt I might be between sizes in terms of which hole to use on the strap, but eventually settled on the slightly tighter one. After a day or two I think it conformed somewhat to my wrist and feels good. I'd perhaps like to add a brown strap in the future. Previous Topic: No reason just because..